After divorcing her high society husband, Tallulah Graver turned her party invites into cleaning invoices. Forced to live in the apartment above her parents’ mortuary and struggling to make ends meet after years of living the high life, Tallie thought her life had hit rock bottom. That is until she finds her ex-husband in the alley after taking some volts to his nether region for which she is now the prime subject. Add to that a dead former frenemy and current house cleaning client, Tallie is in some serious hot water. Can Tallie get to the bottom of the murder mystery before the local police place the blame on her? How will the sudden reappearance of a mysterious man from her childhood play into her mission? And is someone out to get her, dead or alive? She will have to dig deep into the corrupt underbelly of the well to do, a group which she used to be a member, to find her answers. 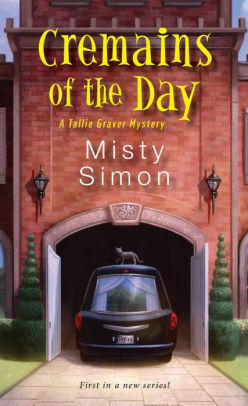 Cremains of the Day is the first book in the new Tallie Graver Mystery series by author Misty Simon. Misty Simon will be signing copies her new book at the Temecula Barnes and Noble, 40570 Winchester Rd., on Saturday January 6th from noon to 3pm. Come pick up a copy and say hello to one killer writer!